The past few months have been filled with long days in the bazaar, combined with even longer days in the university preparing academic articles and trying to make sense of all of my field notes. I presented at a conference in Astana and was able to spend some time with my good friends while there, so that was nice. And in true American fashion, I am planning for life back in DC next year. Never a dull moment. 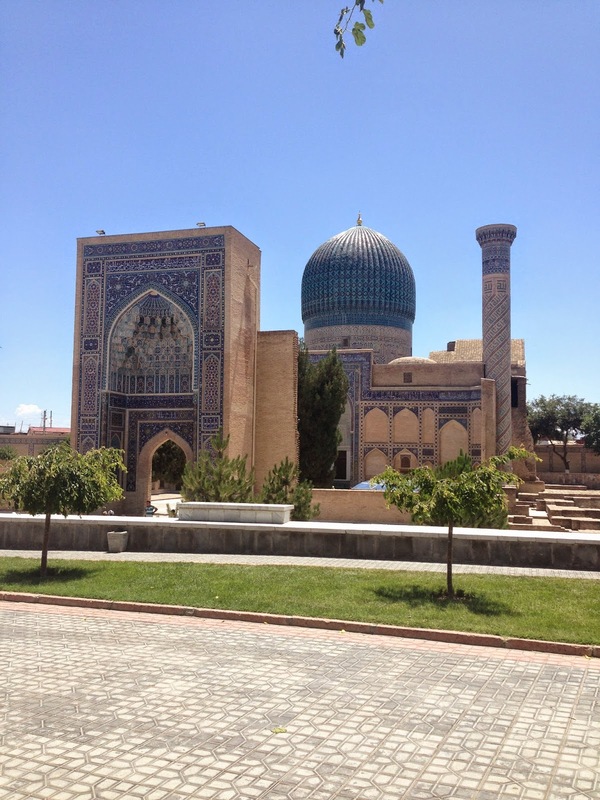 I have been wanted to visit Uzbekistan for some time, and after the Astana conference, I took a week and visited Tashkent, Samarqand and Bukhara. Historically, the modern-day territory of Uzbekistan was under the control of the Mongols, Timurids and various steppe empires (Bukharan Emirate, Kokand Khanate, etc.). Out of all of the Central Asian states, Uzbekistan has the most physical cultural history, as this is largely due to its location in between the Amu Darya and Syr Darya river. Historically, the region was called "Transoxiana" (sometimes spelled Transoxania) which means the land between the Oxuses. For a more familiar parallel, think of Mesopotamia -- "the land between the rivers" -- a hotbed for cultural development by sedentary (as opposed to nomadic) inhabitants -- apply the same principles to Uzbekistan. Due to visa requirements, I went through a tour agency. My tour started in Uzbekistan, where I visited the central square, the textile museum and a Madrasa, where one of the four original Qurans is housed. In Bukhara and Samarqand, I also took a tour and visited all of the major historical sites including tons of Mausoleums and Madrasas, the Summer and Winter Palaces of the last Emir of Bukhara, and some museums. The highlight of the trip was my trip to the Bukharan hamomi bath (banya). I am a huge fan of Russian and Central Asian baths, and I regularly frequent the Arasan Baths in Almaty. But the Bukharan hamomi is unique. You start out in one room that is basically a sauna and open up your pores. Then you move from room to room in what is basically a cave and are massaged by a masseuse/chiropractor. Anthony Bourdain visited an Uzbek hamomi on his show, "No Reservations," and I included a clip here. While my experience was a lot more therapeutic than Bourdain's, the clip is an excellent overview of the hamomi experience. I included a sampling of pictures below, but omit a lot of names and historical details, as this post would go on forever. I apologize if things are out of order -- Blogspot is not cooperating with me in moving pictures around, and my internet connection is kind of slow. Anyways, enjoy, and thanks for your attention! Statue of Amir Temur (Tamerlane) in Tashkent. 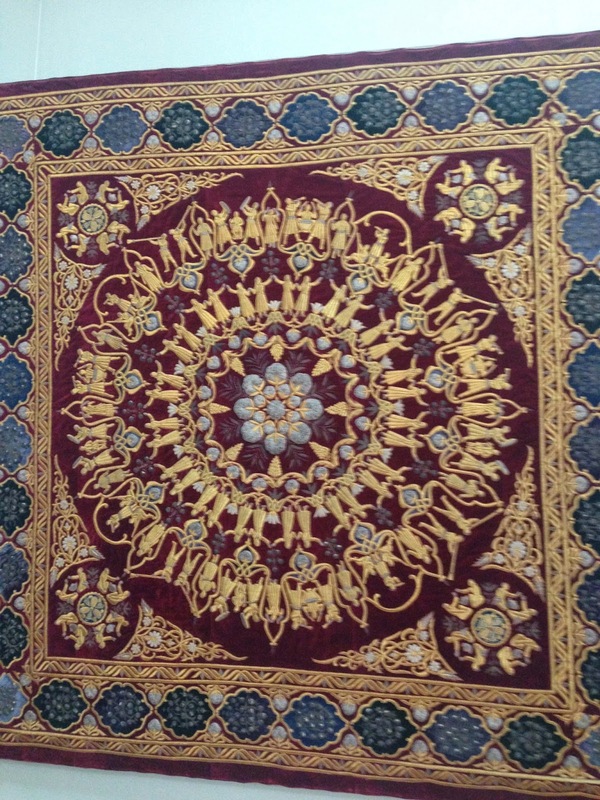 Uzbekistan culture features a variety of handicrafts, one of the most famous is the suzana wall rug. 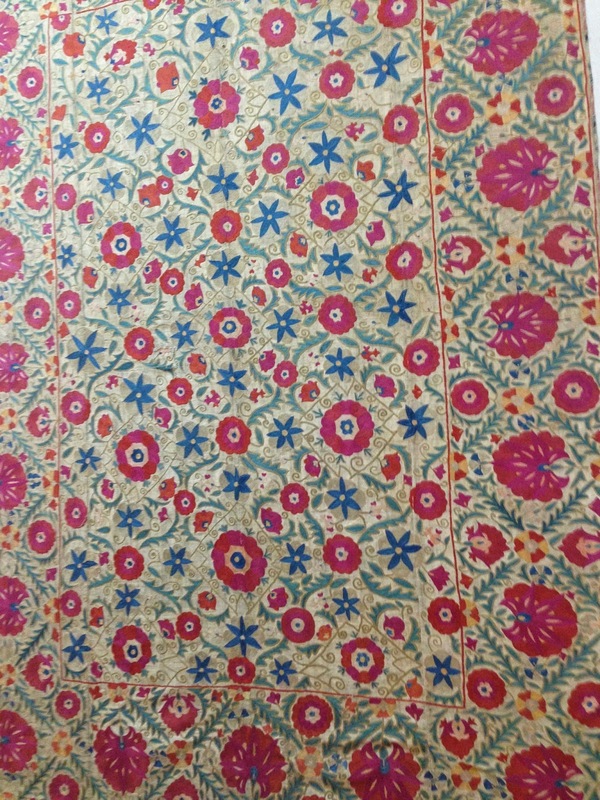 A Bukharan Suzana features a white background (cotton or silk) and colorful, silk embroidery. 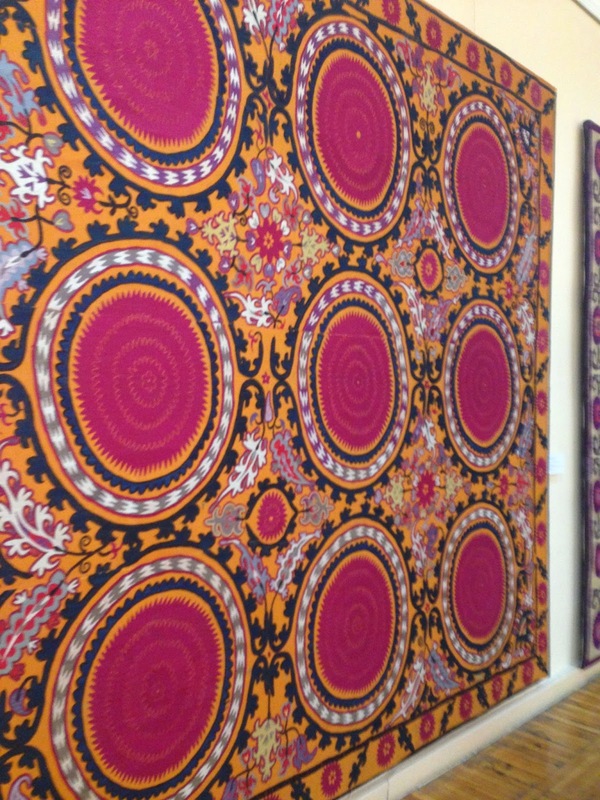 According to my guide, the nine circles represent the nine months of pregnancy in this Suzana. A Suzana made during the Soviet Union to promote the state-run cotton industry. This is an example of how Soviet propaganda adopted local artistic forms. The Old Jewish Quarter in Bukhara. 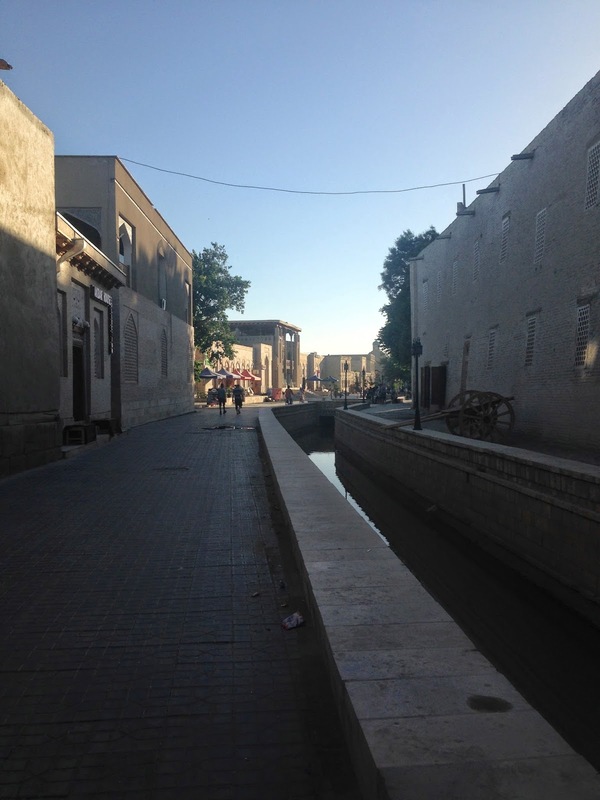 Jewish merchants thrived here during the Silk Road. In Bukhara, there are three main trading domes -- one for furs, one for carpets, and one for money, and not to feed into stereotypes, The Bukharan Jews were particularly successful in the third dome, exchanging money. The Bukharan Jews were also successful musicians who played the shash maqan (stringed instrument) in the Emir's court. And Bukharan hand-weaving and rugs is a byproduct of the Bukharan Jews. Finally, for most Jews unfamiliar with the culture of Bukharan Jews, look at the Bukharan kippah/yamulka, which is very similar to a Uzbek tyubiteka with its highly-geometric shape. A menorah, torah scroll, shofar, shabbat candle stick from the Regional Studies Museum in Samarqand. 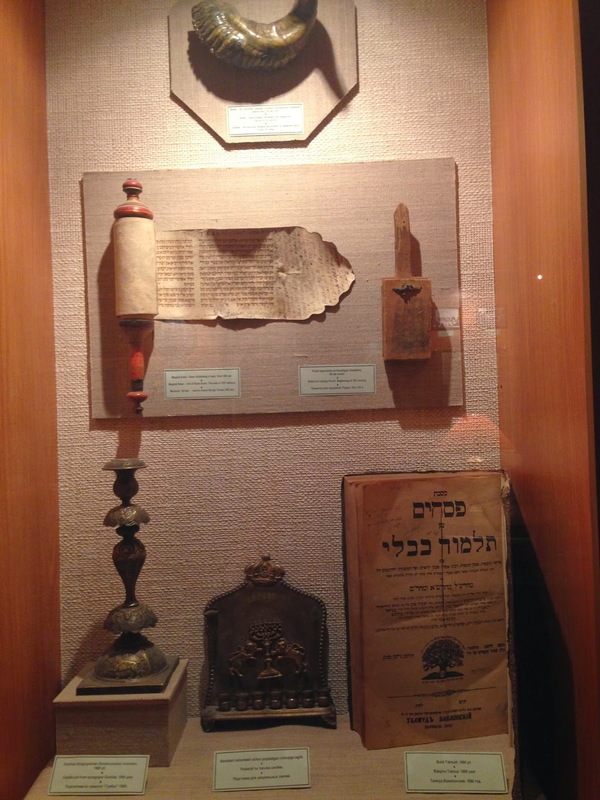 These were owned by Bukharan jews. A hall from inside the Regional Studies Museum. One of two functioning Jewish synagogues in Bukhara. After the fall of the Soviet Union, most of the Bukharan Jews emigrated to Israel or the U.S. The Jews spoke Tajik and Russian, but lacked knowledge of Uzbek so they could not find jobs in an independent Uzbek state. There used to be a vibrant community with thousands of families, and now there are fewer than three hundred Jews here. 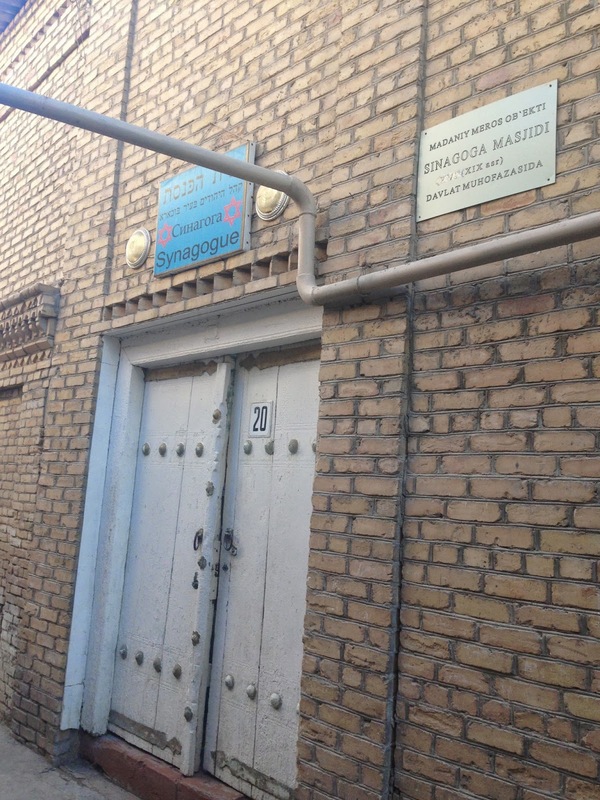 In Samarqand, there used to be 34 synagogues, and now there is one. I went in and met some of the people working there, and it was nice to be back in a Synagogue after living in a place with virtually no Jewish life. At the same time, it is such a shame that the Jewish community has shrunk so much. One of the trade domes in Bukhara. This one is devoted to the carpet trade. 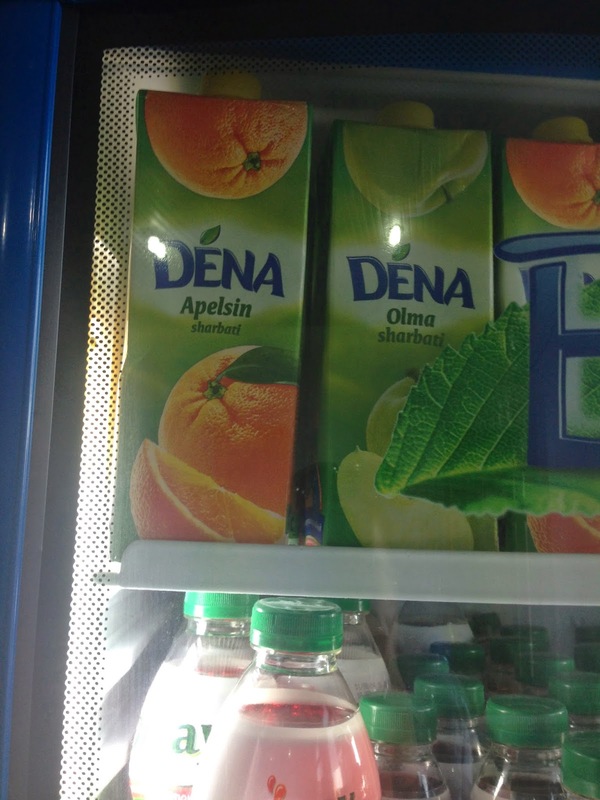 Props to Uzbekistan for naming a juice in my honor. According to my Tajik bratishkas in the bazaar, "Dena" in Tajik means "yesterday." Bolo Hauz mosque in Bukhara. A bazaar in Bukhara where they sell "Gold like Fruit." 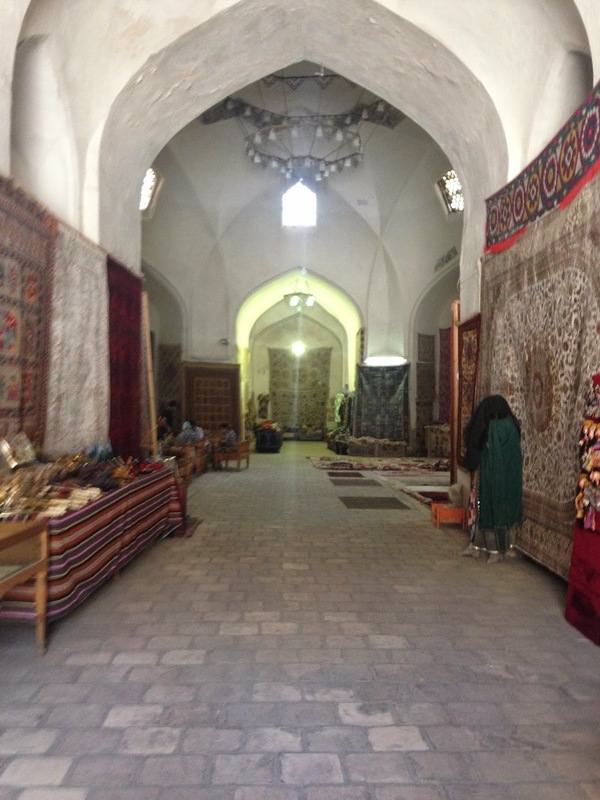 This market neighbors the madrasa and features beautiful, hand-made Bukharan rugs and gold. To many locals, gold and rugs are a store of value and good investment pieces. It is traditional to give these items as gifts during a wedding. Gold, dangling earrings, in particular, are valued by women and gifted by a mother to her daughter at the time of her wedding. Token selfie from Ulughbek Madrasa from Bukhara. The Regional Studies Museum in Bukhara is housed in the converted mansion of Abram Kalantarov, a Russian-Jewish cotton industrialist. Kalantarov finished the house in 1914, but only lived there for four years before his death in 1918. During the Soviet Union, the house remained empty and under the control of the Communist Party. In 1981, it reopened as a museum. 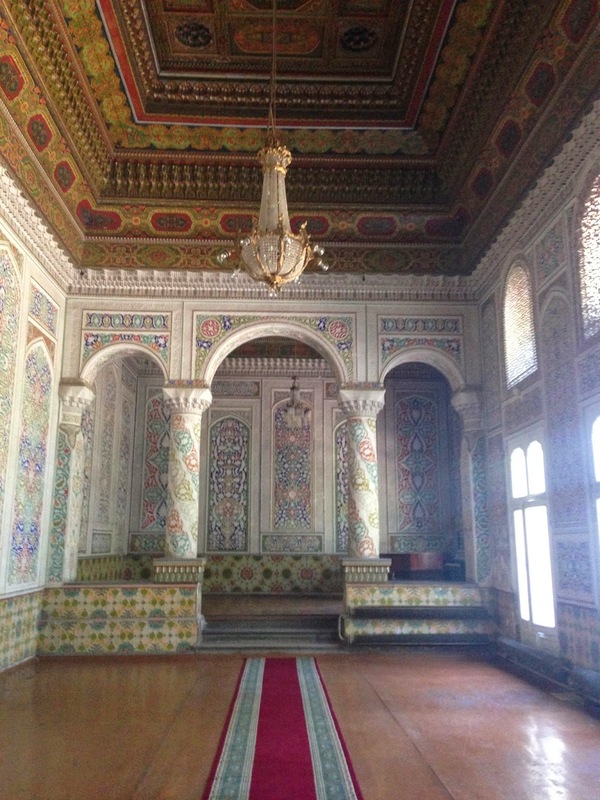 The museum itself is pretty interesting and is a nice overview of Russian, and Jewish, life in Samarqand in the late nineteenth and early twentieth centuries. This photo is a snapshot from a wall mural. You see the symbol of the Russian Empire -- the double headed eagle -- and a Star of David. 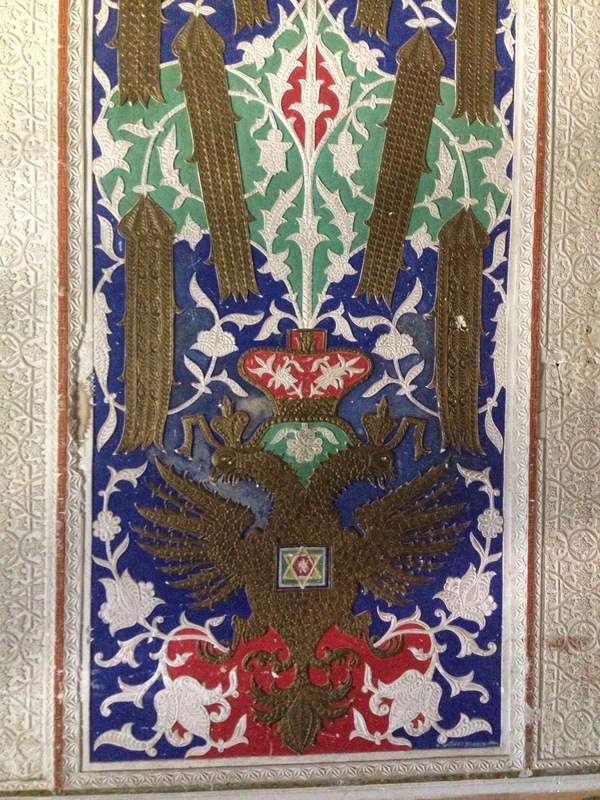 The eagle heads represent the Russian Tsar and the Russian Orthodox Church. So the fact that there is a Jewish star on the symbol of the Russian Empire is extremely fascinating. This symbol illustrates how Russian Imperial rule in Central Asia took on many forms at the local level. Administrators in St. Petersburg, and perhaps Tashkent, were pragmatic and willing to tolerate different interpretations of Tsarist power on the local level insofar as peace and stability existed on the local level, and individuals ran profitable enterprises that contributed to the state treasury. This is also quite a message sent by Kalantarov -- he sees himself as a Jew living in the Christian Orthodox Russian Empire, albeit in a primarily Muslim region. 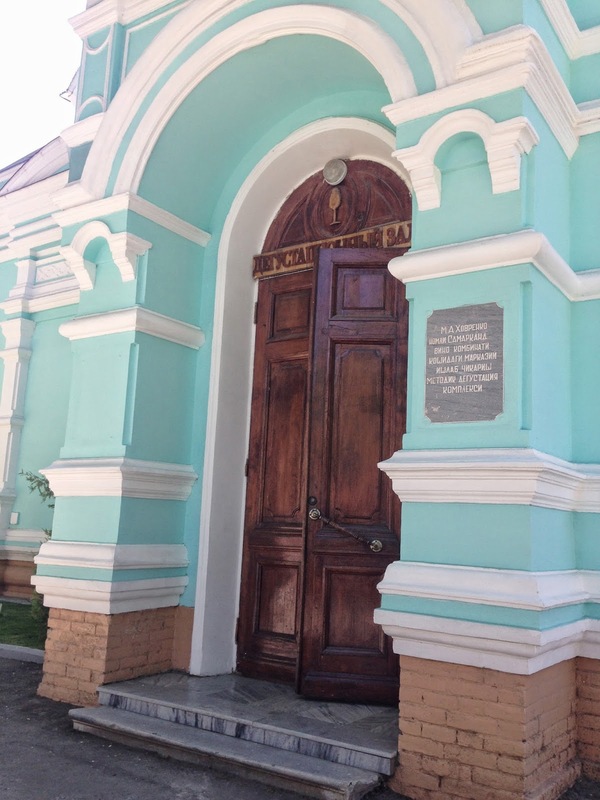 This is the entrance to the Khovrenko winery in Samarqand. 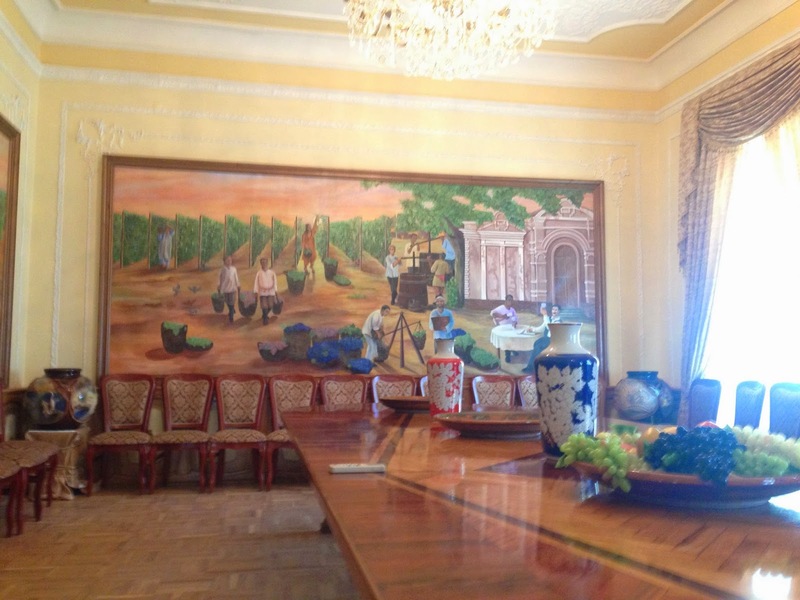 The Khovrenko winery was started in 1868 by Russian-Jewish entrepreneur, D.M. Filatov. Filatov apparently traveled the world and collected an assortment of grape varieties. He brought them to the fertile region of Samarqand and began his wine factory. The factory has produced wines and cognacs since its inception, and during the Soviet period. Recently, the factory incorporated a vodka production facility into its portfolio. My Lonely Planet guidebook recommended a visit to the Khovrenko winery, so I naturally could not resist. I scheduled a tour and a private wine tasting. My tour leader was a sweet Russianized Tajik babushka whose great-grandfather was one of the founding partners of the firm. She spent her life working in the winery and her children and grand-children also work here. I admired her passion for her work and for keeping the factory alive. This ranks high under my list of "good life decisions." Nadir Divan-Begi Madrasa in Bukhara. This was one of two functioning madrasas in Uzbekistan during the Soviet Union, and continues to function. The Mausoleum of Amir Temir and some of his family members and teachers. In Samarqand. Ismail Samani Mausoleum. If you took AP Art History or Introduction to Art history in college, and you used the Jensen textbook, then you should recognize this photo. It is the only one from Central Asia in the book (at least in the version I used in 2008-2009). This is a mausoleum that features Samanid architectures, which includes bare, clay bricks, rather than the turquoise blues tiles and mosaics of Timurid architecture. Legend has it that when the Mongol forces came through Samarqand, the locals hid this mausoleum under a mound of dirt, which preserved it. One of the three Madrasas in the Registan. This one is fascinating because you see there are two faces and lions on the top. Islam prohibits the painting of animals and humans on religious sites. My tour guide said that the Khan who built the madrasa wanted to make a point and display his power by painting a lion. I don't buy that argument, but there are a lot of theories. The "Hippodrome" bazaar in Tashkent is Uzbekistan's equivalent of Almaty's Baraholka. It is a major wholesalers bazaar that feeds small-scale retailers and traders throughout the country. I spent my last day in Uzbekistan in the Hippodrome, comparing prices (on identical goods), and taking in the environment.